You gotta try it: Breakfast at No.10 Fort Cochin, St.Mark's Road, Bengaluru! Breakfast at No.10 Fort Cochin, St.Mark's Road, Bengaluru! Being away from my hometown Kochi, I always miss my family, culture, and the cuisine I love most – Kerala cuisine. Recently a part of Kochi I found in namma ooru, at a restaurant which is barely few months old at St.Mark’s Road – No.10 Fort Cochin Cafe & Restaurant. A couple of us went there for a Sunday breakfast which ultimately turned to be the best brekkie in recent times. The first thing to welcome you even before entering the restaurant building will be the ‘Today’s special’ menu at the entrance. If you are a Keralite or love Kerala food, then you’d surely give it a try after seeing the menu board. The décor and ambiance are pretty good. Most of the Kerala restaurants in Bangalore will overdo the interiors in order to bring the Kerala touch and miserably fail when they serve food. This place is an exception to my above statement. The famous historical spots at Fort Kochi are beautifully illustrated on the walls. As I am not a morning person, a hot cup of strong metre tea and the bright rays of morning sunlight kept me awake while waiting for the food. We met one of the partners, Mr.Anton and he told us the must-have dishes at No.10 Fort Cochin. As our plan was to dig into some delicious Mallu breakfast, we ordered the regular but the extraordinary Kerala breakfast dishes (regular at Kerala households and extraordinary at restaurants when it comes to taste). 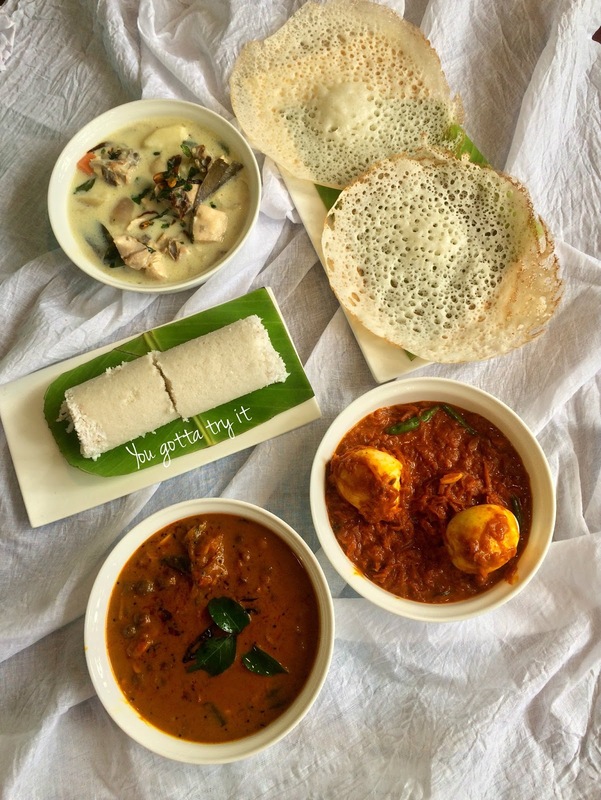 We ordered Appam with Chicken Stew (ishtoo), Egg roast and Veg stew, piping hot Puttu with Varutharacha Kadala curry (Bengal gram curry in fried coconut masala). If I get Appam and Egg Roast, I will forget the entire world. The hot and soft appams made from well-fermented batter was cooked to perfection. The stews were good too especially the Chicken version. Puttu could’ve been slightly better. A bit of moisture was missing in that white beauty. Kadala curry was spot on. Along with breakfast we also shared our thoughts on these dishes. A Bengali friend was so surprised to see us having Puttu with sugar. She tried the same and loved the combo. Their menu has really interesting offerings for seafood lovers. The place will be filled with corporate crowds on working day afternoons and for the same reason, they have included few North Indian dishes on their menu. Considering the location, the menu is decently priced and it's a perfect place for weekend breakfast. Thanks to my Baking Guru and a friend, Caroline to let me know about this wonderful place. It was great catching up with Vinay after ages. And how can I forget three lovely ladies who gave us great company – Vidya, Sangamitra, and Priya. With great company and food, I enjoyed my first experience at No.10 Fort Cochin. I will surely go back soon to try the meals and seafood specialties.